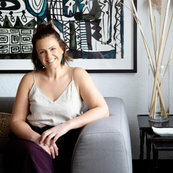 I recently used Katie Sargent to style a spacious up market apartment in Richmond. We worked with Katie Sargent on a interiors project for an office. She is great with colour and design. She is very reliable and proffessional. Katie is an incredible talent and the ultimate professional.